Finds from excavations at Ancient Tenea conducted for the fifth consecutive year, headed by Dr Elena Korka (photo: Ministry of Culture and Sports). 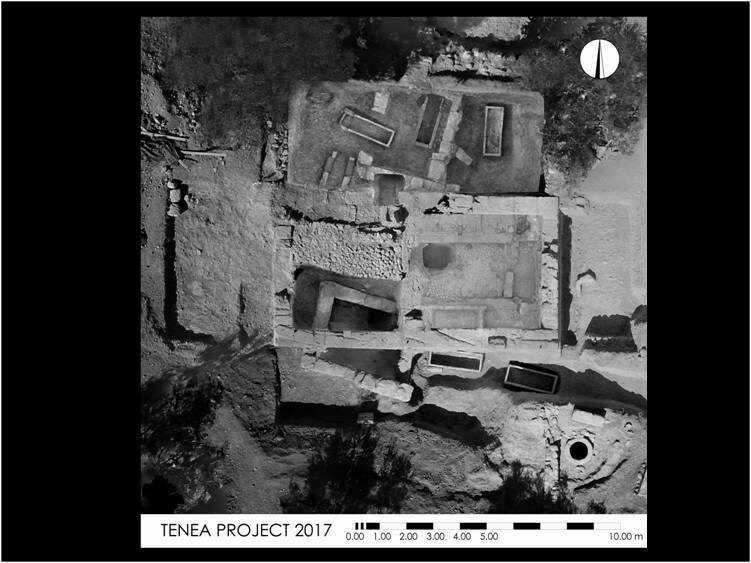 The systematic archaeological research of Ancient Tenea in Chiliomodi, Corinthia by the Directorate General of Antiquities and Cultural Heritage was completed on October 10, 2017. 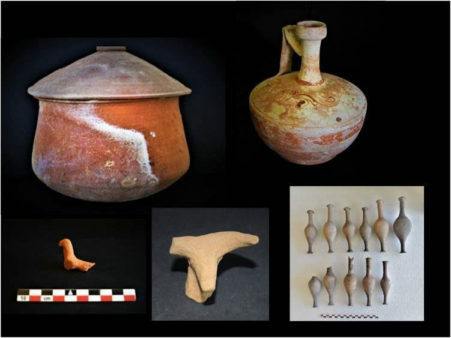 The archaeological research headed by Dr. Elena Korka had been conducted for the fifth consecutive year with the participation of an interdisciplinary team from both the Ministry of Culture and Sports and several Universities. The excavation trenches were centered mainly round the two roomed Roman monument built above ground and uncovered in 2016, confirming the place’s timeless use from the Archaic to the Roman era. The continuation of an organized Roman cemetery, defined by enclosures, was initially revealed on the surface strata, north and east of the Roman funerary monument, 14 tile kalyvites-type tombs were excavated, many of which contained more than one burial, with grave goods such as oil lamps, vases, and coins from the 1st to the 4th century AD. Standing out among them is an oil lamp with a signature from a Corinthian workshop of the 1st century AD bearing an image of Aphrodite and two cupids on its disc. Strong constructions were located at a greater depth, probably belonging to a building complex that extended on a north-south axis beneath the Roman monument and the cemetery of Roman graves. Specifically, underneath and outside the southwest side of the Roman funerary monument and below its antechamber, a rectangular underground area from Hellenistic times was excavated, made of isodomic porous blocks, coated with a carefully applied, thick layer of mortar over all the inside of its surface and floor. On the ground of its northeast corner, a rectangular porous structure coated with the same mortar was found in situ, a plastered cavity being in front of it. A large amount of skeletal material was collected from its interior, a mass of painted tiles, pottery made up mainly of burial and ritual vases, dating from Archaic to Roman times. The head of a bull figurine also came from the same place. There was likewise an impressive amount of concentrated cremations in the space’s interior. 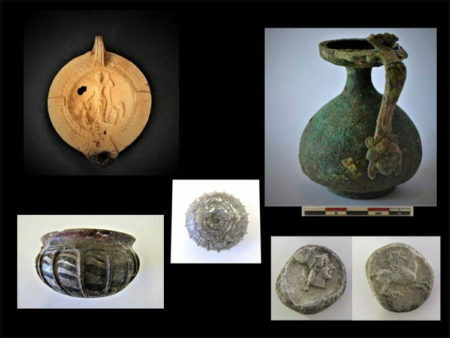 Moreover, in a cremation examined outside its northwest corner, an assemblage was found of complete miniature vases from the Hellenistic era and many parts of others that belonged together. To the north of the underground area and alongside it, a wall was revealed also of the Hellenistic era with solid foundations which later was partly covered over by the main chamber of the Roman funerary monument. Two more walls of the same period, parallel to each other, were constructed vertically to the first one. Hellenistic ceramics were collected from the backfill in the spaces between these walls, among which was also the figurine of a dove. In a third even later Hellenistic phase, the walls were hollowed out in places for graves to be contained. Five tombs were discovered (monolithic sarcophagi, box and pit tombs) that were all covered by porous stone slabs. All the burials had rich grave goods. A particular burial stands out that contained a gilded bronze wreath with myrtle leaves and fruit, a gold ring, red pigments, a bone flute, spindle shaped tiles made of bone, and a bronze mirror with a relief decoration of a cupid, as well as a gold danake from a Sikyon coin. 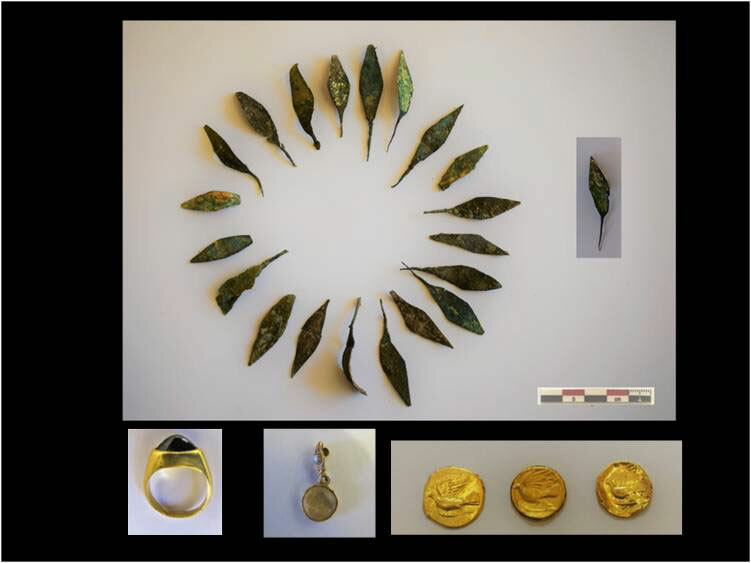 The grave goods in the other tombs are mainly ointment pots, ornamental pins made of bone, a great number of bone spoons, an egg shell, a piece of wood, oil lamps, miniature vases, bowls, cups, iron scrapers, gold danakes and bronze coins as well as an embossed gold leaf. A 1st c. AD burial was located among the Hellenistic tombs, in a Hellenistic sarcophagus with a small addition from the Roman era on its west side. 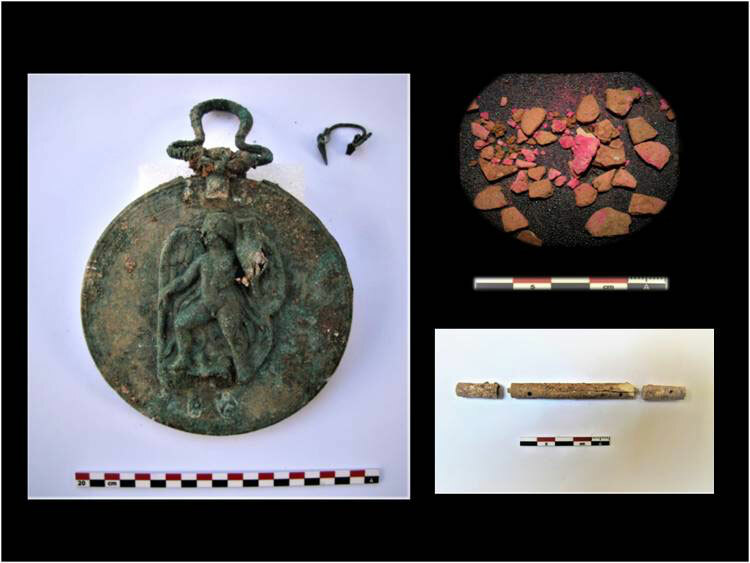 This burial yielded a complete, ornate calyx bowl, a bronze wine jug, an iron scrapper with an ornate handle, bulb shaped ointment pots, a pitcher, miniature vases, a bronze coin, and bronze nails with semicircular heads from shoe soles. Moreover, to the south of the Roman funerary monument and east of the underground area, at the bottom of its foundations, two Hellenistic, monolithic sarcophagi were located. There were more than two burials inside them. In one of them a burial urn was found and a large assemblage of Hellenistic ointment pots. From the thorough clearing of the Roman funerary monument, an archaic capital was found and many Hellenistic architectural members such as pillars, stone plinths with various kinds of joints, pins, etc., an Ionic architrave with an inlaid cornice, the drum of an ionic column, part of a stylobate as well as other architectural members, which were used a second time round to build the foundations of the Roman monument. The Hellenistic areas underneath the Roman funerary monument, such as the underground chamber, are of particular interest, since these spaces and their finds have led archaeologists to the conclusion that these were connected with rituals. Surveying and geophysical probing with georadars also continued this year, adding more data to the research on the habitation of ancient Tenea. Participating in the programme were students from Greek universities and abroad, who worked and studied as part of the research work. At the same time, educational programmes were carried out for students of the district.